Another feature added on the HP-45, was the formatted display. It added both fixed and scientific displays with a choice of the number of digits displayed. 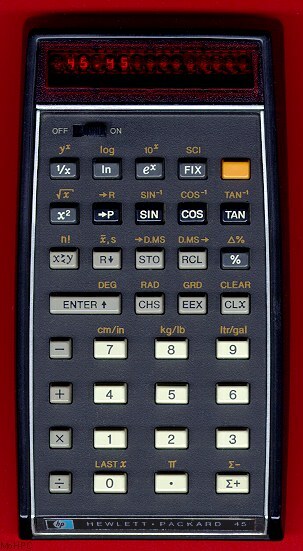 The HP-35 had only what is now commonly called "standard mode". In fixed mode the HP-45 would display sufficiently small numbers as 0. Starting with the 20 series, HPs automatically switched to scientific display when this would happen. It also added conversion factors for a few units like in/cm. When you pressed one of these conversion factor keys, the conversion factor was entered into the x register and then the user could use it to multiply or divide as needed. Unlike the HP-35, this calculator had no "clear the entire machine" button. However, its back plate points out that you can clear everything by turning the machine off and then on. "Little is understood about the methods used by calculating prodigies to perform their awesome feats. The method used by 10-year-old Truman Henry Safford, in 1846 to calculate 365365365365365365^2 (as described by the Rev. H. W. Adams) shows that difficult problems are difficult even for prodigies--"...he flew around the room like a top, pulled his pantaloons over the tops of his boots, bit his hands, rolled his eyes in their sockets, sometimes smiling and talking and then seeming to be in agony, until, in not more than a minute said he, 133,491,850,208,566,925,016,658,299,941,583,225!" "Although your HP-45 might not be as much fun to watch, it makes calculating faster and less arduous, because the operational stack and the reverse "Polish" notation used by the HP-45 provide the most efficient way known to computer science for evaluating mathematical expressions." "Incidentally, no calculator available today (including ours) can handle the problem given to our child prodigy. Isn't it comforting to know that people can still do things machines can't?" 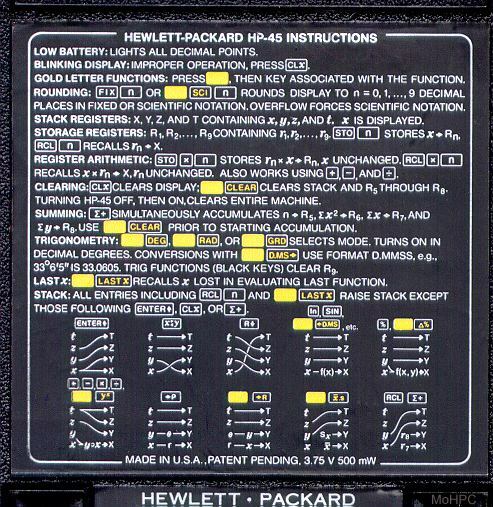 The HP-45 had code to implement a timer. This was never exposed as a user feature because the lack of a quartz crystal in the HP-45 made the timer fairly inaccurate. The timer could be invoked by pressing RCL and then pressing CHS 7 8 all at the same time. Once in timer mode, CHS toggled it between running and stopped. Pressing 1-9 stored the current time in that register when the timer was running or recalled the stored time when the timer was stopped. 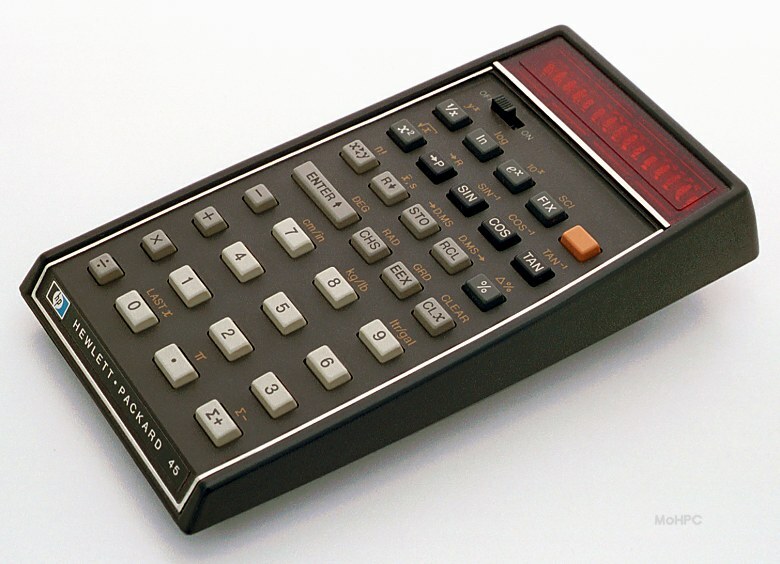 Pressing the decimal point key, brought the calculator back to normal mode with the time still in the display. (Pressing Enter also resumed normal mode but cleared the display.) It's possible to add a crystal to the HP-45.